Many playgrounds claim to be handicap accessible. But any parent of a disabled child, or disabled parents themselves, will tell you that accessible and inclusive can be entirely different. The Madison Claire Foundation is building the first fully inclusive playground built in the East Metro and will be the only accessible playground in MN that is fully ramped, allowing access to every point of the playground. The mission of the Madison Claire Foundation is not simply a commitment to a single playground in a single community. It is a commitment to setting the standard for how people think about and plan for inclusive play. Our first project – Madison’s Place – will not only be state-of-the-art in its design and installation, but it will serve as a model for future projects in other communities in Minnesota. Communities where you live. Communities where you want to live. A playground is much more than a space with a swing set and a slide. As communities grapple with decisions about building or replacing existing playgrounds, the Madison Claire Foundation hopes to inspire innovative thinking on the investment in inclusive playgrounds. Playgrounds are places for kids to gather – to burn off energy, to make new friends, to build their confidence. 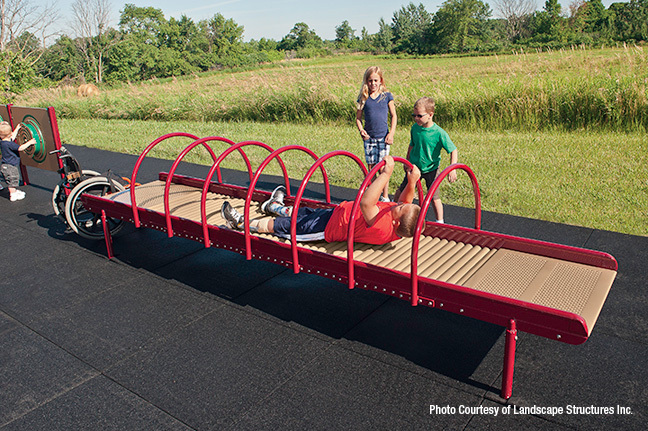 Playgrounds are places for families to gather – for parents with disabilities, Madison’s Place will give them the opportunity to play with their children on the playground. Playgrounds are places for neighbors to gather – an inclusive playground will say a lot about a community hoping to serve as a thought leader in serving residents. By challenging everyone who has ever experienced the unmitigated joy of climbing to the top of a slide or swinging their feet to the top of the sky to stop and think of offering that gift to children and adults who have never experienced that same sense of freedom or excitement of climbing up onto a playground, the Madison Claire Foundation is raising the bar for creating thriving, livable communities. You can join us in our mission to help build a play destination for families to enjoy what many of us take for granted – a day at the park! Please consider making a donation today.